There needs little introduction on how e-commerce technology has transformed the manner in which businesses sell their products and services. It has blurred the lines between manufacturers and their customers across B2B and B2C segments and opened up new opportunities on a global scale. Today, buyers are completely aware of what they want and explore various e-commerce marketplaces before zeroing on the best-fit product. The days when traditional marketing efforts influenced his/her buying behavior and drove them to the nearest store to buy products are fast diminishing. This doesn’t mean physical stores have become extinct. They are still present and a thriving force in the retail segment. In the B2B segment, businesses have realized that starting an e-commerce platform is not an option anymore. It has taken up a mandatory position in the business planning strategy of these businesses. They know that having an online marketplace increases the awareness of their products and its value to customers. Also, they have access to their customers not only locally, but across the globe. An e-commerce platform boosts manufacturer’s growth efforts and helps them expand their business in less time. Let us look at why is it so important for a manufacturer to adopt e-commerce into their business. A traditional setup involves promoting your business through cold-calling, deploying field resources, engage in traditional advertising, attending trade-shows and promoting your website. These activities surely take up a considerable amount of time, effort and money. An e-commerce platform will not necessarily eliminate this setup. You will still continue to follow the traditional business practices. However, the platform greatly expands your ability to directly connect with potential customers, varied businesses and retailers from across the globe in a short span of time. Imagine your store being open to customers 24/7 and not just during the day. The convenience of your customers looking at your products online and place an order instantly at any time from any place boosts your production and business numbers considerably. An e-commerce platform holds a treasure trove of useful customer data for you. Based on this, you can make changes to your sales forecast and production planning by knowing what products are in most-demand, most-sold, and in what regions. The data also provides you an in depth demographic detail of customers helping you to take critical decisions on customer requirements, product portfolio, logistics, pricing, product marketing etc. In a traditional setup, each order is manually entered by a resource as and when they come in. This increases the chances of typographical errors in the entered order leading to delay in production and product shipment. Also, there are high chances of entering the wrong inventory details which can lead to over-selling, over-production etc. In an online marketplace, the customer enters the order details themselves, decreasing the chances of errors. The human intervention is less as data automatically flows between the marketplace and backend systems leading to increased data accuracy and smooth operational control. Inventory updates are instantaneous on each order thereby ensuring correct information is available to customers and business owners at all times. Having an online marketplace increases your ability to promote your brand. Designing the marketplace in accordance with Search Engine Optimization (SEO) guidelines ensures that your business/product details crop up in the initial search results every time a potential customer searches for the relevant product. This increases the visibility of your business leading to more customers, more trust, brand-recognition and growth. All customer interactions in a B2B setup can be done online through the platform and there’s no need for your sales rep to visit the customer place for redundant tasks. In turn, they can concentrate more on meaningful and strategic discussions necessary in a B2B environment. The transactional discussions can happen online via the e-commerce platform. Adopting an e-commerce platform for your business is not a complicated process. There are a slew of ready-to-integrate products in the market that you can choose from. You can either opt to go with a third-party vendor such as Amazon or e-bay, where you create an account and start hosting your products for sale. If you are looking to create a custom marketplace personalized for your business, you can go with Shopify. Apart from hosting the marketplace, these vendors also specialize in integrating with your backend tools for swift and streamlined information flow. Just adopting an e-commerce platform won’t solve most of your problems. The true strength lies in integrating it with your backend systems such as an ERP software. Let us look at the scenario given below. A customer places an order on your online shopping platform. As soon as the order is submitted, the order information is reflected on your ERP software. The ERP checks the inventory levels to see if the product is available to be shipped from existing stock or needs to be manufactured. If the product is in stock, then the ERP initiates the packaging and shipment process. The packing slip is created and the product is shipped to the customer. The shipment details are sent to the online shopping platform which in turn makes it available to the customer. If the product is not in stock, it checks if sufficient raw materials are available to manufacture the product. If not, then it automatically places a procurement order with the supplier to ship the material at the earliest. The order due date is accordingly modified based on the arrival of materials and total time required to manufacture the product. If the raw material is readily available, the ERP creates a Work Order for the shop-floor personnel who manufacture the product. The product is then packed and shipped to the customer based on the details in the Sales Order. The customer receives up-to-date information on when the product was shipped, its current location and by when he would receive it. On shipment, the invoice is generated and sent to the customer. The customer has various payment choices and can make the payment accordingly. Once, the shipment is successful, the order gets closed on the online platform and within the ERP. The inventory details are automatically updated in the ERP and on the e-commerce platform. This ensures that correct information is displayed at all times for both customers and the business. It reduces over-selling in case of higher inventory levels and overproduction in case of lesser inventory levels. At every stage, there is no human intervention in terms of entering/modifying data. Both the ERP and e-commerce platform continuously talk to each other and exchange information pertaining to the customer order. If the customer modifies the order from his end, the ERP makes those changes accordingly in its system. The end-to-end integration ensures real-time information being shared between both systems thereby increasing efficiency and speed-of-sale. Order placement by customers, order approval and updates are quick thereby reducing the sales turn-around-time. Inventory updates are instantaneous thereby providing complete visibility of available inventory to customers at any given time. Using Webhooks, API and other integration technologies, you can add multiple e-commerce/online and offline stores for multiple product-lines. Reduce manual entry errors that usually occur while entering order details, inventory numbers, item details, customer information and shipping details. 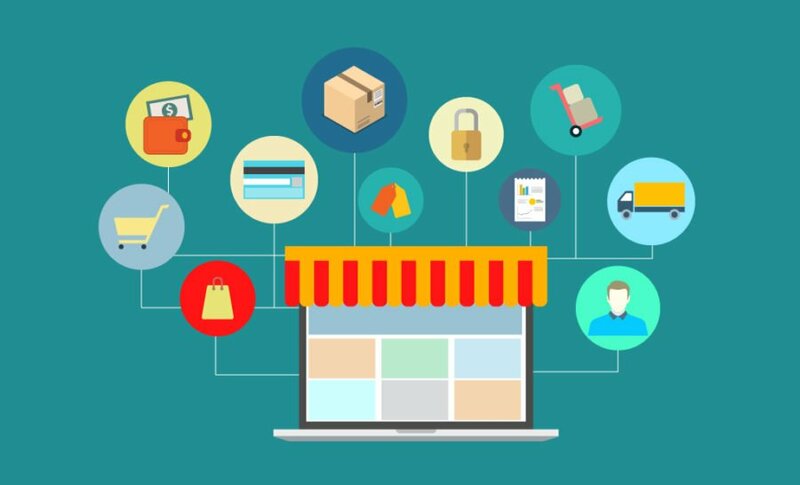 Overall, e-commerce integration gives a huge boost to the manufacturer resulting in higher online sales, larger customer reach, speedy recall & customer-refund (in case of faulty product and exchange/return), improved customer trust and increased profitability. The future of e-commerce in B2B category is very bright. Manufacturing businesses want to grow quickly and beat the competition from across the globe. For that, they would have to adopt technology to reach customers quickly with their products. Also, a streamlined sales platform will give much more bandwidth for manufacturers to shift their focus on expanding their product portfolio and diversify their reach. This automatically translates to the much needed traction and business growth. So, when are you implementing e-commerce in your organization?